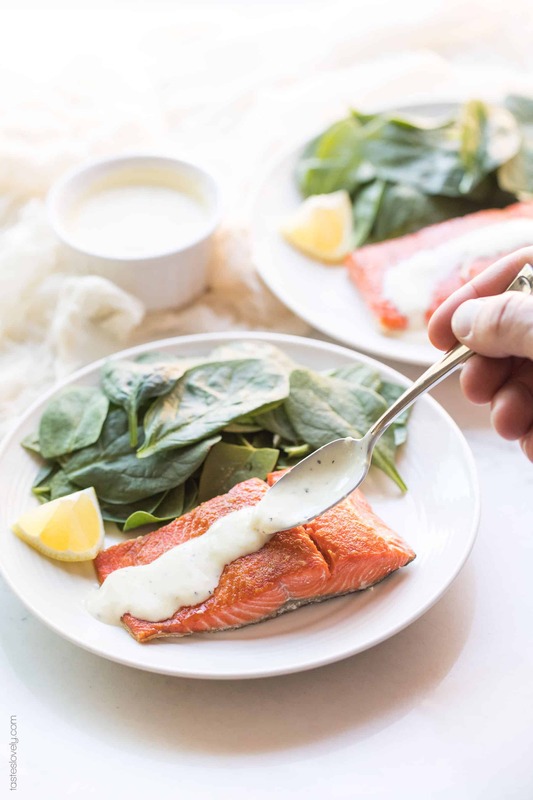 Paleo, Whole30 + Keto Salmon with Creamy Garlic Aioli Recipe – pan seared salmon topped with a lemony and garlicy aioli sauce. Ready in 15 minutes! Gluten free, grain free, dairy free, sugar free, healthy living, clean eating. 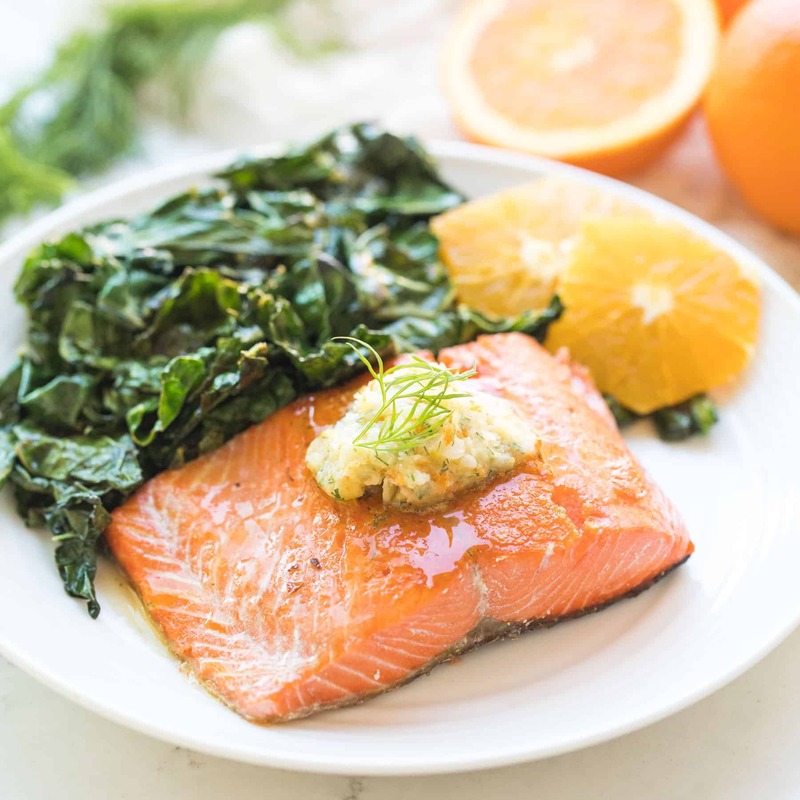 I am so excited about this paleo, whole30 + keto salmon with lemon garlic aioli because it is ready in 15 minutes! You guys, FIFTEEN MINUTES! Now that’s a weeknight dinner. It’s so super simple, with the most perfect flavors. Don’t you love a fuss free dinner recipe? It starts off with pan searing the salmon. I love using this large skillet over medium high heat. I let the pan heat up for a good 3 minutes before putting the salmon on. 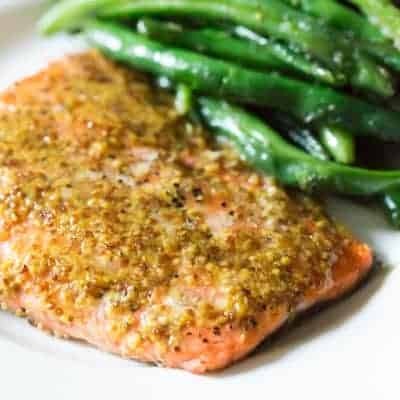 As soon as you put the salmon on the skillet you want to hear that sizzle. That’s the secret to a good golden crust. The other secret? Making sure the salmon is completely dry. No moisture whatsoever. I take a paper towel and pat it dry really well. Any moisture will create steam when it is searing and prevent a crust. 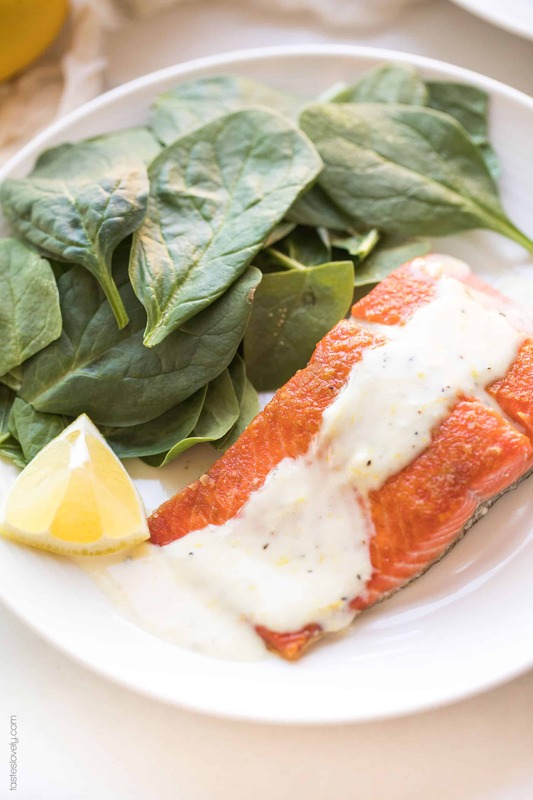 To make this salmon extra tasty, I top it with a lemon garlic aioli. You may recognize it. It’s the same one I love using to dip my artichokes in! The base is made using my paleo + whole30 mayo. Have you guys made your own mayonnaise yet? I am obsessed! It tastes so much better than store bought. And tons of readers agree. Just check out that post, over 100 comments from readers sharing their praises! 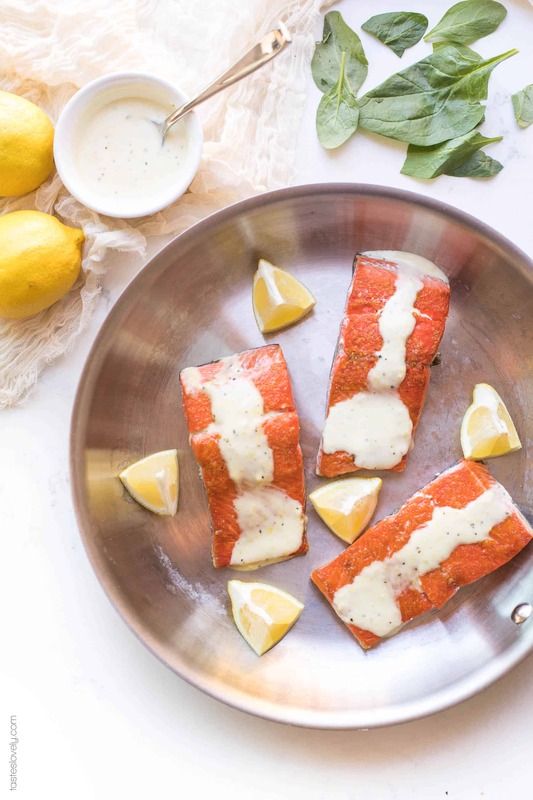 Add in some lemon zest, lemon juice, garlic, salt and pepper and you have the perfect lemon garlic aioli to top the salmon with. I serve salmon at least once a week. Always wild caught. I buy it at Costco and love the quality. My 2 year old loves it too! He eats an entire salmon filet to himself. Anytime there is a dip involved, he is a happy camper. 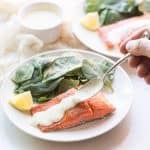 This paleo, whole30 + keto salmon with lemon garlic aioli is great alongside a simple salad, or some sautéed or roasted veggies. You’re going to love how quickly it comes together, how delicious it is, and how it is beyond healthy. 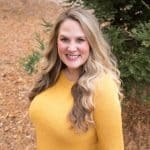 Paleo, whole30, keto, gluten free, grain free, dairy free, sugar free, soy free, healthy living, clean eating, real food. 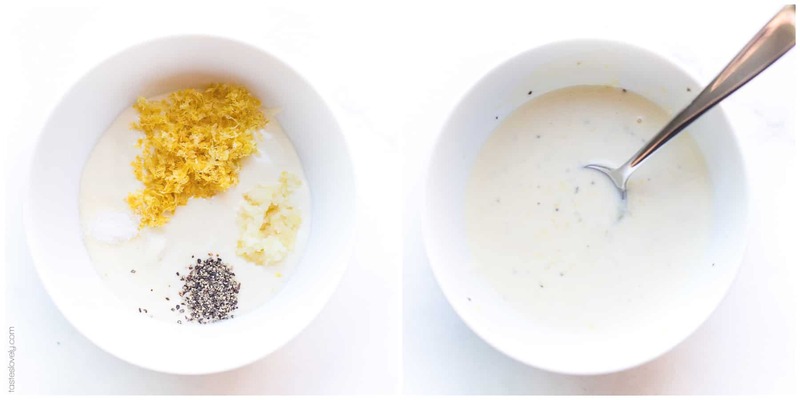 Make the lemon garlic aioli by combining all ingredients in a small bowl. Stir and set aside. Preheat your skillet over medium high heat. 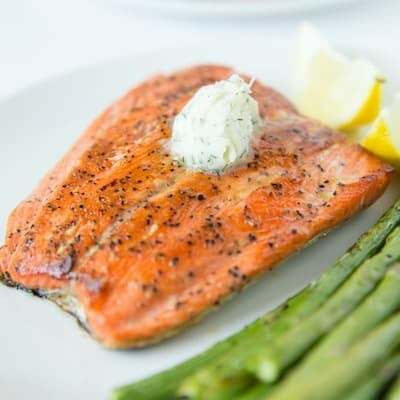 Pat the salmon dry with paper towels, then season with salt and pepper. Add the olive oil, and sear the salmon until slightly crispy and golden, about 5 minutes. Flip and cook an additional 1-2 minutes, until the salmon has an internal temperature of 125ºF. 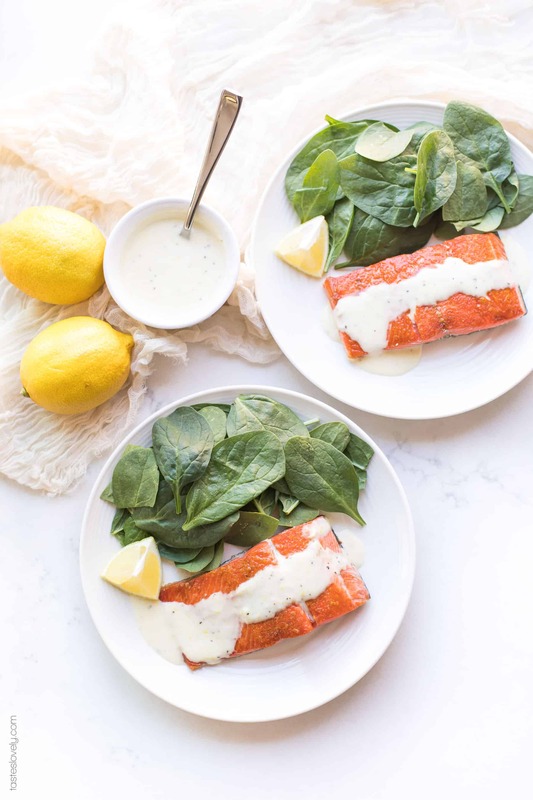 Serve the salmon warm topped with the lemon garlic aioli.